February 18, 2015: They say the passage of time brings clarity. Hindsight brings learnings. As Aero India 2015 begins, there are two parallel sentiments, each contradicting the other. The first is of hope. Fuelled by the new government's promise of quick decisions, unprecedented attention to the Indian warfighter, a focus on catapulting India beyond the buyer-seller quagmire it has languished in for integrated and advanced military systems for decades. The second is one of increasing despondence, where the now familiar unpredictability, uncertainly, systemic fog and arbitrariness simply refuse to settle. The one thing established Indian and global vendors will be looking for is clarity, for there can never be enough of it from the political leadership of a country that continues to perforce swim against the tide of globally dwindling defence budgets. The second thing stakeholders at Aero India 2015 will be looking for is a dialogue in specifics that moves beyond the impressive but so far relatively nebulous ideal of 'Make in India'. Prime Minister Narendra Modi, who breaks tradition by personally inaugurating the show this year, has made it clear on more than once occasion that national security and matters military interest and captivate him, and that no decision that ensures a stronger warfighter will be allowed to hang fire. But vendors who anxiously watch the 'Make in India' campaign play out will also be hoping that the stated touchstones of efficiency, expeditiousness don't bring with them a whimsical posture on ongoing procurement programmes. Sections of the global vendor pool perceive that they have suffered this in India in the first few months of the new government. But Aero India isn't about despondence, but the possibilities of a new hope. The one thing that the government has made clear, through stated policy and otherwise, is that aerospace manufacturing, partnerships, local sourcing of subsystems and components will be a focus area for the overall economic thrust the government needs to boost India's growth. Willy-nilly the face of the great Indian buying machine, the Indian Air Force's (IAF) medium multirole combat aircraft (MMRCA) programme has experienced turbulence for nearly 12 months now. France, which will have gloomily celebrated the third anniversary of India's selection of the Dassault Aviation Rafale in January 2012, for a multi-billion dollar contract, is now grappling with ironically the most crucial aspect of the programme — the 'Make in India' part. As India and France attempt hard-nosed final negotiations to beat down these unexpected late issues, the Rafale's maker has finally managed to extinguish its 'no exports yet' tag, managing to seal a deal with Egypt for 24 Rafales. 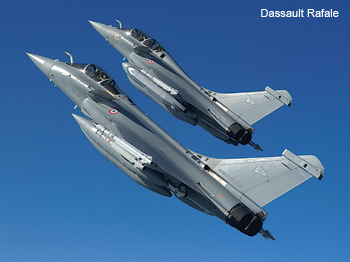 The sale gives France a sliver of latitude in negotiations, and eases pressure ever so slightly on the Rafale production line, but Dassault knows that the Indian deal is make or break. The prospect of selling 126 Rafales (with 63 options, making a total of 189) to the Indian Air Force is too big a programme to let falter at this late stage. The pressure games and mindgames are now at fever pitch. With everything else answered, the only question remains: will there be a contract once the two sides exit the cloud they're in. Aero India 2015 also serves as a reminder that key acquisitions remain tantalisingly close to contracts, but no cigar. Days ahead of the show, Boeing Defense indicated that inflationary pressures were being felt, implying that it could maintain the commercial bids for 15 CH-47F Chinook heavy-lift helicopters and 22 AH-64E Apache Longbow attack helicopters only for a limited period, sparking the notion of more delays if India doesn't make a quick decision. The fact that the IAF desperately needs both rotorcraft types makes the situation a critical one. Boeing isn't sure when a decision will be made. As Boeing India President Pratyush Kumar says, "We've done our bit. Now it's up to the government to take a decision." 'Done our bit.' Words you'll hear often in the vendor community especially when it comes to doing business in India. But what next? Much has happened since Aero India 2013. For starters, the 197 light reconnaissance and surveillance helicopters (RSH) for the Army and IAF, was cancelled by the new government in office, dealing a surprise blow to Airbus Helicopters (then Eurocopter) and Russia's Kamov that had been waiting virtually endlessly without clarity for a decision. The government has now kickstarted the competition afresh as 'Make in India' programme, clubbed together with the naval utility helicopter programme. Airbus and Kamov, along with other vendors, are likely to announce their decisions on participation at the show starting today. Delays in the competition forced by a decision not to buy most of the helicopters from abroad (the RSH competition stipulated a 100 per cent delivery from OEM production lines), could give India's Hindustan Aeronautics Ltd (HAL) an advantage. It is speeding along with its light utility helicopter (LUH), a mock-up of which is on display at Yelahanka, to furnish an additional requirement of 184 light helicopters that will progressively go to the winner of the RSH in the event of delays. The scrapping of the RSH buy in its earlier avatar may have just pushed the reset button on timelines. The Indian Air Force's ambitious replacement programme for 56 HS-748 Avro transport aircraft has taken wing, though the MoD is still looking at how to proceed on the programme given only one response—from Airbus/Tata—came in. Since the last Aero India, the Indian Air Force has contracted for six more Lockheed Martin C-130J Super Hercules special transports with minor modifications from the first lot. However, the C-17 Globemaster III programme remains unclear. Boeing's Long Beach production facility has closed, but the company still has an unspecified number of C-17 white-tails (built but unsold aircraft) that it plans to contract to customers on a first-come-first-served basis, based on US Government clearance. While Boeing has periodically heard of India's interest in procuring more, the company confirms it has received no formal request or message. As the largest foreign operator of C-17s, Boeing hopes India will move on the availability of white-tails to augment its 10-strong fleet based at Hindon. But again, no clarity yet. Meanwhile, with the last two of eight P-8I long-range maritime reconnaissance (LRMR) jets to be delivered this year, Boeing is looking for guidance on follow-on orders of at least four aircraft, but expected to be more. Airbus, on the other hand, awaits clarity on the sale of 6 Airbus A330 MRTT to the IAF. Enormous opportunities exist for unmanned air systems across the board in India. Apart from continuing opportunities to procure full systems — the Indian Navy continues to be in the market for a maritime MALE system (the Indian Navy recently also announced interest in acquiring at least 50 ship-borne unmanned air systems), the Indian Army is looking for a man-portable MAV system to name just two instances — there are several co-development opportunities as well, both ab initio as well as mid-course programmes. It is virtually certain that with pressing time-lines and impatient customers, HAL and DRDO will be forced to draft in the help of experienced consultants to complete current programmes. For instance, the Rustom-2 MALE multi-role UAV, expected to make its first flight this year, is currently in a routine of taxi trials. The Indian unmanned strike air vehicle (IUSAV) is a hugely ambitious UCAV programme that is still in a project definition stage, but could provide big opportunities. There have been strides in weapons testing and procurement activities as well. The Indian Navy remains in the search for a new medium-range anti-ship missile, while the Army continues its search for a stand-off loitering weapon. Since the last Aero India, the DRDO has successfully tested India's first loitering cruise weapon, Nirbhay. A big-ticket missile programme that has slowed down in what vendors hope is the final lap, is the VSHORADS (very short-range air defence system), currently a three-way fight between the French MBDA Mistral, Sweden's Saab RBS 70 NG and Russia's KBM new generation Igla-S. The deal could be worth $6 billion and involve the purchase of 1,000 launchers with 6,000 missiles. MBDA, which had tasted sweet success a year ago with the Indian Government handing it a �950-million deal for MICA air-to-air missiles for the IAF's upgraded Mirage 2000 multi-role fighters, the company is now eagerly awaiting the results of the competition to supply short-range IR air-to-air missiles for the IAF's Jaguars. MBDA and Israel's Rafael await a verdict on what is a toss-up between MBDA's ASRAAM and Rafael's Python-5. Israel and India finally tested their joint LR-SAM/Barak 8 missile system late in 2014, setting the stage for further testing this year. With the first series production LCA Tejas handed over to the IAF, a new dawn on the programme has hopefully begun. The focus now shifts to the LCA MK.II for both the IAF and Indian Navy. At Aero India this year, teams from the Aeronautical Development Agency (ADA) will be scouting for partnerships on the MK.II. Several indigenous programmes including the delayed Indian multi-role helicopter (IMRH), light utility helicopter (LUH), multi-role transport aircraft (MTA) and others could throw up very serious sourcing and other opportunities for foreign and Indian vendors at every level. Another enormous opportunity is the Indian National Civil Aircraft (NCA), which by itself, could present the most profound spaces for cooperation in new technologies. A team from the National Aerospace Laboratories (NAL) is at Aero India to move forward the dialogue with engine houses and suppliers of the millions of components necessary for a civil aircraft project. The new political dynamic brings with it, hopefully, the promise of a renewed focus on aerospace in the country. The Prime Minister's presence at Aero India this year should be seen as a commitment of that. Have a good show!